And within each Recharge series there are a host of models which are composed of different layers of material, different thicknesses of material, etc. Of course, as usual, the naming convention of the different models is such that shopping for one model in different stores will be a frustrating/impossible experience (you can read more about that here). Most of these mattresses have 800 pocketed coils (this is sometimes referred to as spring density). A spring density of 800 means that a Queen size will have 800 springs – spring density generally uses a Queen as the benchmark. So a King with a spring density of 800 would actually have more than 800 springs (as the King is larger than a Queen) while a twin would have less (as the Twin is a smaller bed). 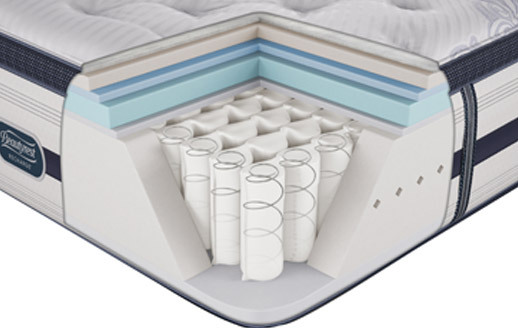 A few select “Beautyrest Recharge” mattresses can have a spring density of 850. Also, the more expensive “Beautyrest Recharge” mattresses often contain more AirCool Memory Foam. 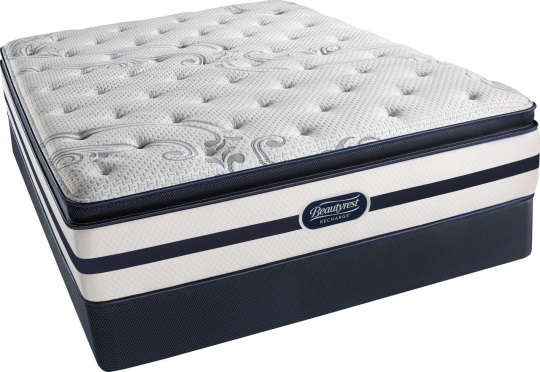 The “Beautyrest Recharge” is known as one of the more firm mattresses that Simmons manufactures. One of the reasons being the heavy gauge steel used in the springs/coils. Some of the “firm” versions also have fairly dense foams. You will sometimes see the spring density for the more expensive “Recharge World Class” mattresses recorded as 2000. That is the sum of the normal Beautyrest Pocketed Coils and the MicroCoils. Like the “Beautyrest Recharge” and the “Beautyrest World Class”, the “Beautyrest Recharge Hybrid” mattresses have Beautyrest pocketed coils and several different foams (Aircool memory foam, Aircool gel memory foam, etc). However, some of these layers of memory foam may be thicker than what you can get in the other Recharge mattress series. 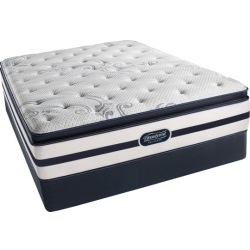 In addition, select high-end hybrid mattresses also have what Simmons call AirCool® Max Memory Foam. This foam, according to Simmons, uses the conductive properties of micro-diamonds to help remove heat from the mattress and maintain a comfortable sleeping temperature. Many of the high tech foams on the market today tout their ability to dissipate heat and we suspect this material, in some way or another, accomplishes the same thing. The use of diamonds may, perhaps, be truly innovative or it may simply be the result of an over-imaginative marketing department. All Recharge mattresses are CertiPUR-US certified. This means the flexible polyurethane foam in the mattresses has been independently laboratory tested and certified. Certified foam products have passed rigorous tests ensuring low emissions for indoor air quality. CertiPUR-US is an extension of a European program developed by the association of European flexible polyurethane foam block manufacturers. They test foams for physical performance, environmental stewardship and indoor emissions. The foams in the mattress have low VOC’s, no CFC’s or ozone depleters, no PBDE flame retardants, no heavy metals, no formaldehyde, and no prohibited phthalates. I’m sure CertiPUR-US does their job well but bear in mind that this group was put together by members of the global foam industry. You can read more about mattress usage, care and the Simmons mattress warranty in this PDF document. After scanning comments from a range of Recharge mattress owners some similar likes and dislikes appear. Of course, the mattress construction and comfort levels vary widely, but there are still some common threads. Owners often report that the Recharge is very comfortable and quite a few folks highlight its ability to relieve aches and pains (this is fairly common with mattresses that contain a sufficient thickness and density of memory foam). However, several owners have complained about the mattress getting indents that will not go away, and in some cases a permanent “hump” is created in the middle of the bed (if there are two people sleeping on it). In addition, if you get a comfort level that is too cushy for you, you may end up exacerbating any aches or pains (this is true for almost any mattress). And, despite all the cooling features in the memory foam, some owners complain that the mattress tends to sleep a little hot. You can read more Recharge owner reviews on Amazon if you wish. If you are a Simmons Recharge Mattress Owner please let us and others know what you think of your mattress. Over the years we have found that the most valuable information about a mattress comes from the consumer, and sharing your experiences is a way to help others make a more informed decision.